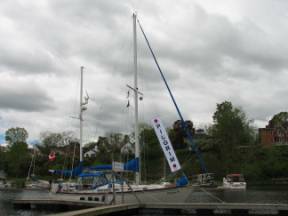 On Tuesday, May 16 we left Whitby in the rain, but the east wind that had delayed our departure for 3 days was finally calm. 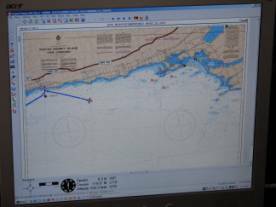 We motored the 50+ nautical miles to Cobourg. It was so good to feel the gentle waves under Pilgrim and feel the clean water washing her rather scummy waterline. 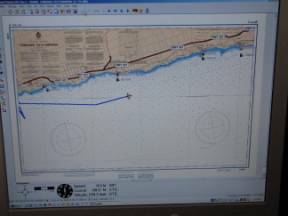 Wednesday we continued east with a good southwest wind (15-20 knots). 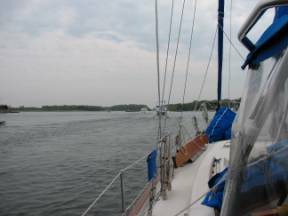 We unfurled the genoa and mainsails and had great sail to Presqu’ile Peninsula, 30 miles further east. 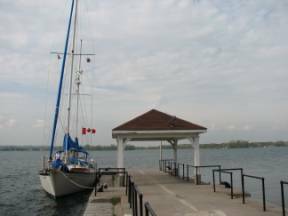 The peninsula is a provincial park and bird sanctuary. We knew we were finally away from cities because of the quantity and variety of insects (great for the birds). 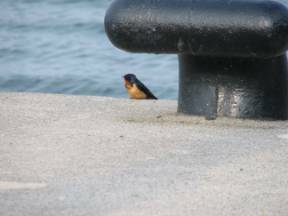 A barn swallow befriended out boat, and we heard a number of bird songs we have never heard before. 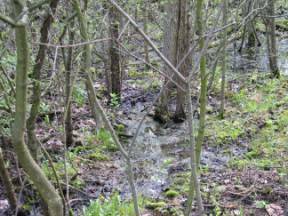 There were a number of small bogs. A fine feathered friend I wonder if this is the Bog ”Persons” environment? 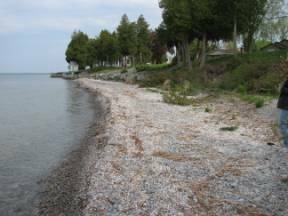 Along one beach there were rocks and thousands of zebra mussel shells bleached white. We think because the bay is so shallow, in the winter the water freezes to the bottom and then ice is blown onto the shore, scraping up the zebra mussel shells. They really crunched underfoot. There used to be a hotel at this site at the turn of the century, and famous dance bands played here for hotel residents and visitors who arrived by ferry. Now the hotel is gone, and there are about 150 houses but only along the shore. 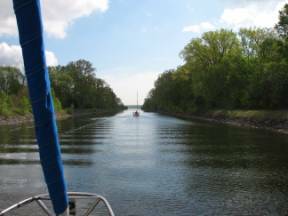 Thursday we motored the short distance from Presqu’ile Park through Presqu’ile Bay to the Murray Canal, scheduled to open for the season on Friday. 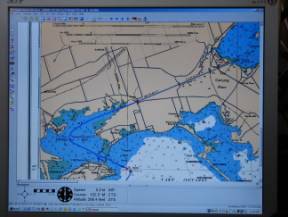 Presqu’ile Bay is very shallow, with a buoyed channel that is 8-13 feet deep. The rest of the bay is very shallow. 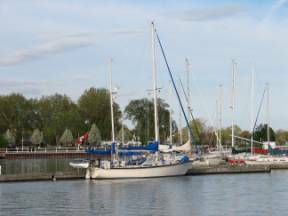 As we approached the entrance to the Murray Canal, a fleet of new 34-foot PDQ power boats (catamarans) that were manufactured in Whitby last winter, descended on us. 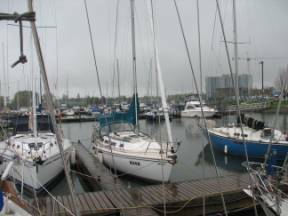 The new owners were taking them home, to various US ports along the east coast. 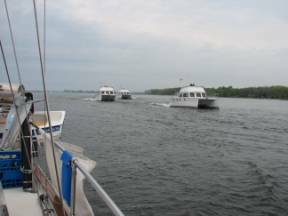 The PDQs overtook us at full speed … all 8 of them, throwing up a large wake that made it very difficult to steer. We radioed when we saw them approaching requesting them to slow down, but they just muscled there way through. 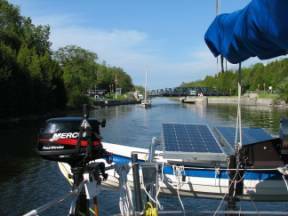 When we realized they were actually going through the Murray Canal a day before it opened, we called the Brighton Road Bridge operator on the VHF radio to ask if we could “tag along.” He said, “For $200. 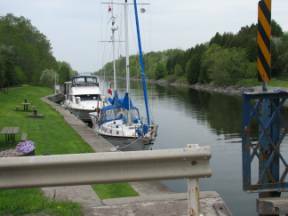 you can.” We decided to dock at the bridge until Friday morning when the canal officially opened for the season and pay our $5. fee. 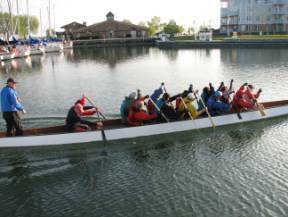 At this point we had 2 feet under the keel and a 20 foot channel between 3 foot mud bottoms on both sides. When we got to the Brighton Road Bridge, the bridgemaster helped us dock. My first question to him, once our lines were secured was, “Are you the bridgemaster who Stuart McLean interviewed last October?” He said he was. (For non-Canadians, Stuart McLean is the equivalent of Garrison Keeler in the US… a great storyteller who has a weekly show on the CBC). There were several downpours during the afternoon. Friday morning we were the first through the bridge. 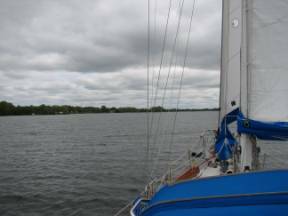 We motored through the canal and into the Bay of Quinte to Bellville. 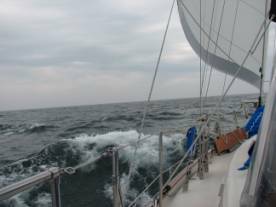 Then the wind picked up to 15-20 knots from the SW so we had a great sail. The fish finder showed hoards of fish, and Brian had a downrigger out for a while, but we caught nothing (nor did any of the fishermen in boats and on the shore that we saw). 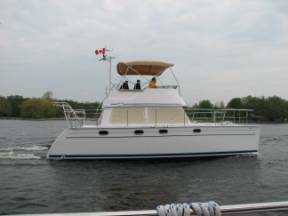 We anchored in a bay halfway between Bellville and Picton in which Brian had caught pickerel on previous visits. The strong wind continued Saturday, Sunday and Monday. Our wind generator did a great job of keeping up with our power needs. On Saturday it rained all day, and on Sunday we had about 5 downpours followed by brilliant blue sky, but no rainbows. It was cold enough (48 F or 7 C) in the cabin to use our diesel furnace. Sunday Brian caught his first fish of the season, a Northern Pike. 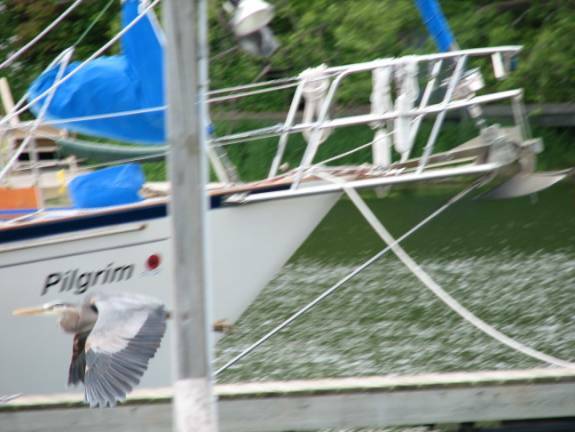 There were two Great Blue Herons in our bay. Sometimes they waded along the shore, but they also flew very low over the water, as if searching for small fish near the surface of the water, and occasionally they actually landed in the water with wings kept open to keep them from sinking and allow them to take off. We have never seen this before. 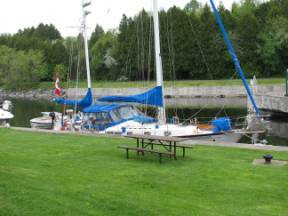 Monday we had another great sail through the Telegraph Narrows and down Long Reach to Picton.